File this under the “wow, just wow” category. 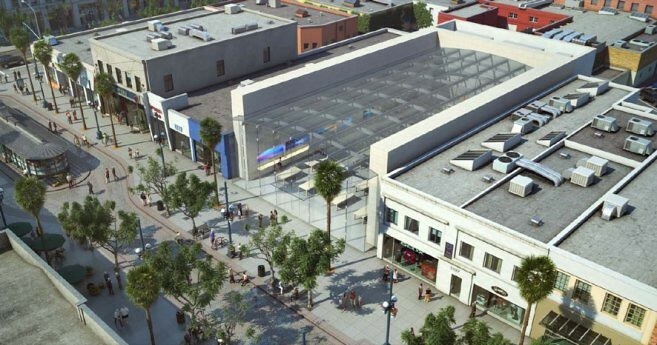 According to Curbed (via MacRumors), Apple could be interested in building a new store at the Third Street Promenade in Santa Monica, California, right in the neighborhood of another store the company already runs in the area. What’s interesting about this particular brick-and-mortar shop is concept. Breaking away from its usual flagship stores design, this could be Apple’s first-ever flagship store with an all-glass transparent ceiling (sans the Upper West Side store), accentuated by an “expansive floor-to-ceiling height”, per this proposal (PDF document) from applicant Howard Robinson. The applicant will offer all full-time retail employees a $100 monthly transit subsidy towards the purchase of transit fare and a $20 per month bicycle reimbursement subsidy for improvements, maintenance, and service. In addition, secure bicycle parking for employees of the building will be located in the basement level. Apple is also replacing the iconic glass cube on the Fifth Avenue with an updated design reportedly worth $6 million. It calls for a seamless appearance stemming from the use of fifteen glass panes, three per side, down from ninety. All those endeavors pale in comparison with a monumental 23,000-square-foot retail space that will be integrated right inside New York’s landmarked Grand Central Terminal. In addition, Apple is believed to be building a store inside Union Station, Denver’s enormous rail station currently undergoing an impressive rejuvenation.